"Loudon County" redirects here. For the county in Virginia, see Loudoun County, Virginia. Loudon County is a county located in the U.S. state of Tennessee. As of the 2010 census, the population was 48,556. Its county seat is Loudon. Loudon County was formed on May 27, 1870, from portions of Roane, Monroe and Blount counties. Originally, it was named Christiana County, but a few days later the name was changed to Loudon in honor of nearby colonial-era Fort Loudoun. The fort was named for John Campbell, 4th Earl of Loudoun and a commander of British forces during the French and Indian Wars. In August 1870, the county officers were chosen. On September 5, 1870, the county court was organized at the Baptist Church in Loudon. This church became the temporary quarters of the county court until the new building, built by J. W. Clark & Brothers, was finished in 1872. Bussell Island, at the mouth of the Little Tennessee River, was inhabited by Native Americans for several thousand years before the arrival of the region's first European settlers. The Overhill Cherokee village of Mialoquo was located along the Little Tennessee near modern Tellico Village. Fort Loudoun was constructed by the British near modern Vonore in 1756, and was destroyed by the Cherokee four years later. 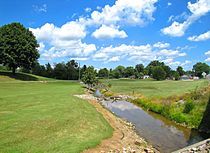 One of the earliest American settlements in what is now Loudon County was a river port and ferry known as Morganton, once located on the banks of the Little Tennessee River near modern Greenback. Morganton thrived during the early 19th century, but declined with the rise of the railroad in the latter half of the century. The town's remnants were inundated by Tellico Lake in the 1970s. Lenoir City is rooted in a plantation established by William Ballard Lenoir in 1810, which by the 1850s included a railroad stop known as Lenoir Station. The Lenoir City Company, established by Knoxville financiers Charles McClung McGhee and Edward J. Sanford, platted modern Lenoir City in the 1890s. The town of Loudon began as a ferry and later steamboat stop known as Blair's Ferry, established by James Blair and his brother-in-law, John Hudson Carmichael, in the 1810s. The town changed its name to "Loudon" during the early 1850s, when it expanded following the arrival of the railroad. The railroad bridge at Loudon was one of eight bridges targeted for destruction by Union guerillas as part of the East Tennessee bridge-burning conspiracy in November 1861, at the outset of the Civil War. The bridge was too well-guarded by Confederate sentries, however, and the guerillas abandoned the effort. According to the U.S. Census Bureau, the county has a total area of 247 square miles (640 km2), of which 229 square miles (590 km2) is land and 18 square miles (47 km2) (7.3%) is water. As of the census of 2000, there were 39,086 people, 15,944 households, and 11,798 families residing in the county. The population density was 171 people per square mile (66/km²). There were 17,277 housing units at an average density of 76 per square mile (29/km²). The racial makeup of the county was 95.90% White, 1.14% Black or African American, 0.32% Native American, 0.21% Asian, 0.02% Pacific Islander, 1.43% from other races, and 0.98% from two or more races. 2.29% of the population were Hispanic or Latino of any race. There were 15,944 households out of which 28.40% had children under the age of 18 living with them, 61.70% were married couples living together, 8.90% had a female householder with no husband present, and 26.00% were non-families. 22.80% of all households were made up of individuals and 10.10% had someone living alone who was 65 years of age or older. The average household size was 2.42 and the average family size was 2.82. In the county, the population was spread out with 21.90% under the age of 18, 6.70% from 18 to 24, 27.50% from 25 to 44, 27.70% from 45 to 64, and 16.20% who were 65 years of age or older. The median age was 41 years. For every 100 females, there were 95.10 males. For every 100 females age 18 and over, there were 92.10 males. The median income for a household in the county was $40,401, and the median income for a family was $46,517. Males had a median income of $33,567 versus $23,164 for females. The per capita income for the county was $21,061. About 6.90% of families and 10.00% of the population were below the poverty line, including 12.80% of those under age 18 and 9.00% of those age 65 or over. The public schools in all areas of the county except Lenoir City are operated by Loudon County Schools. ^ a b Joe Spence, "Loudon County," Tennessee Encyclopedia of History and Culture. Retrieved: 22 October 2013. ^ M.R. Harrington, Cherokee and Earlier Remains on Upper Tennessee River (New York: Museum of the American Indian, Heye Foundation, 1922), pp. 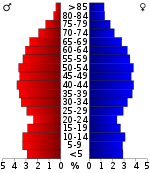 61–82. ^ Kurt Russ and Jefferson Chapman, Archaeological Investigations at the Eighteenth Century Overhill Cherokee Town of Mialoquo (40MR3) (University of Tennessee Department of Anthropology, Report of Investigations 37, 1983), pp. 16-18. ^ James Polhemus and Richard Polhemus, An Assessment of the Archaeological Potential of Townsite of Morganton in Loudon County, Tennessee (Knoxville, Tenn.: Tennessee Valley Authority, 1978), pp. 1-2. ^ John Benhart, Appalachian Aspirations: The Geography of Urbanization and Development in the Upper Tennessee River Valley, 1865-1900 (Knoxville, Tenn.: University of Tennessee Press, 2007), pp. 74-79. ^ Benhart, Appalachian Aspirations, pp. 23-25. ^ Oliver Perry Temple, East Tennessee and the Civil War (Cincinnati: The Robert Clark Company, 1899), pp. 370–406. Wikimedia Commons has media related to Loudon County, Tennessee.